Michael Ritson, tech wizard and QTVI from Oldham, talks about screen-sharing software and offers advice for beginners. 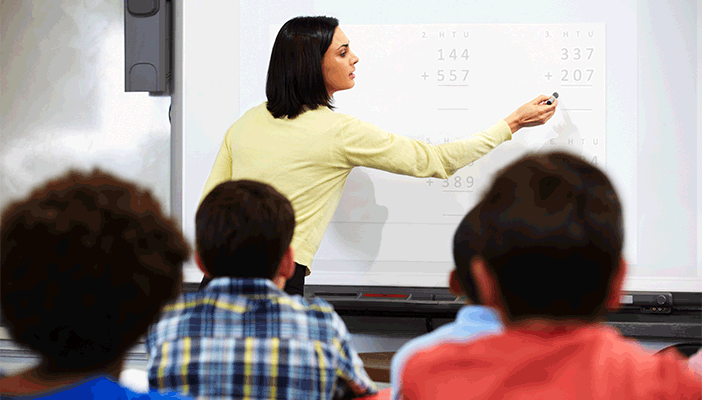 However, many of these challenges can be overcome if the interactive whiteboard is used with screen-sharing software. This is generally a pair of programs or apps which work together (when linked with a code) to transmit content on the whiteboard from the teacher’s computer directly to the pupil’s laptop or tablet via internet or wi-fi. It effectively gives the pupil a remote monitor that they can use to zoom in and out. Although screen-sharing software was originally intended to allow collaboration between offices across the world, it can also offer immediate access benefits to learners who have vision impairment (VI) within the classroom. The learner is instantly freed from being positioned at the front of the classroom or at the teacher’s computer. And as a result, they can more easily engage in group work, with their own accessible version of what the rest of the class can see on the board. There is an ever-expanding galaxy of combinations of what IT specialists like to call “solutions” in use within classrooms: interactive whiteboards, projectors, touchscreen monitors, plasma displays and so on (and no guarantees that the same set up will even be found in each classroom in the same school!). Most classrooms have the teacher’s internet-connected computer feeding a projector or large screen of some kind, and most schools have a wi-fi network. This is the essential list of ingredients necessary to use screen-sharing software, though the exact recipe for success will depend on the available hardware, the school network and often the most important – developing a good working relationship with the IT technician! Which screen-sharing software should I try? Learners are able to control and adjust the screen angle, contrast, colour and magnification settings on their own device, as well as pause when needed. And because the focusing distance is drastically cut down, this can be a real help in reducing visual fatigue. Occasionally, the connection can slow or drop out completely depending on the speed and connection quality of the school wi-fi. If this happens, it may be necessary for the teacher to restart the meeting from their screen sharing control panel and the pupil will need to input the meeting code again as a new one is generated each time a screen sharing session is hosted.